I'm quickly learning that sous vide cooking is not just for protein. Sous vide cooking is a wonderful method for many vegetables. Sous vide vegetables are cooked in their own juices, resulting in tender vegetables with intense flavor and superior vitamin retention. Carrots taste more carroty, cauliflower tastes more cauliflowery and mushrooms taste more mushroomy. Check out our Minted Sous Vide Carrots with Balsamic and Goat Cheese and Healthy Sous Vide Garlic Cauliflower Mash for two more sous vide vegetable recipes. These mushrooms take 10 minutes of hands on time to make and 30 minutes in a sous vide bath. Make a few bags at a time as they will keep in the fridge for about five days. If you are making the mushrooms for future use, remove them from the sous vide and place them in a bowl of ice ice water for 10 minutes before storing in the fridge. The ice bath cools them down to a safe temperature, minimizing prolonged warm conditions that can promote bacterial growth. Mushrooms are light and not very dense. Therefore you need to weigh down the bag to keep them submerged. My favorite way to weigh them down is to insert one or two of these sous vide weights in the bag before I vacuum seal them. They are made of stainless steel covered in food-safe silicone. Alternatively you can clip a heavy serving spoon to the bottom of the bag, place the bag in a sous vide rack or even throw a heavy kitchen towel over the top of the bag to keep it submerged. I've tried all of these techniques and more and for me the weights are the best answer. 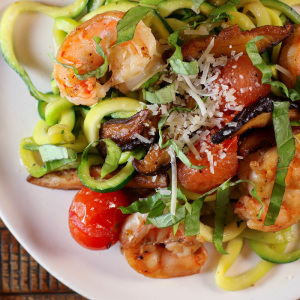 These mushrooms are incredibly versatile. If you leave them whole they can be served as appetizers or a side dish. They are wonderful as a topping for Healthy Sous Vide Garlic Cauliflower Mash (my husbands personal favorite.) Spread these mushrooms on toast with a little goat cheese for a delicious crostini, add them to scrambled eggs or incorporate them into a salad. 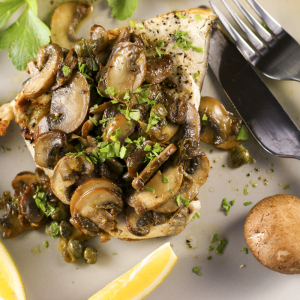 These umami-rich mushrooms can be used in so many ways to make your meals more delicious. These umami-rich sous vide mushrooms can be used in so many ways to make your meals delicious. They take 10 minutes of active time to prepare and 30 minutes in a sous vide bath. Prepare multiple bags at a time and store them in the fridge for later use. Heat a sous vide bath to 185 degrees. Trim mushroom stems and place in plastic bag or vacuum bag along with one or two sous vide weights if you plan to use them. Season with salt and pepper, olive oil, shoyu and thyme. Seal using the displacement method or a vacuum sealer. When the water bath comes to temperature place the bags in the bath and cook for 30 minutes. After 30 minutes remove the bag from the bath. If you are preparing in advance to serve at a later time, plunge the bag into a bowl of ice water for 10 minutes to cool down. Remove from the ice water, wipe down and store in the fridge for up to 5 days. If you are planning on serving immediately, melt the butter in a shallow pan over medium heat and saute for 2 - 3 minutes, stirring so garlic doesn't burn. Drain the contents of the bag into the pan, add balsamic vinegar and bring to a boil. Reduce the liquid until it has thickened and is about half its original volume. Reduce the temperature and add the mushrooms to the pan, stirring until the mushrooms are coated with the sauce. Remove, adjust seasoning and serve. 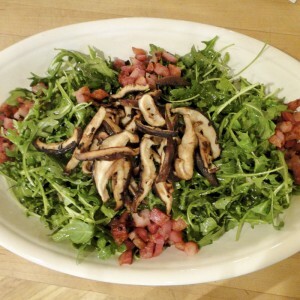 Mushrooms can be trimmed and sliced or trimmed and cooked whole, depending on how you plan to serve them. Mushrooms are lightweight and need additional weights to keep submerged. You can add sous vide weights to the bag before vacuum sealing or clip weights or a heavy serving spoon to the outside of the bag to weigh down the bag and keep it submerged. Other techniques include placing in a sous vide rack or simply putting a heavy kitchen towel on top of the bag to weigh it down.